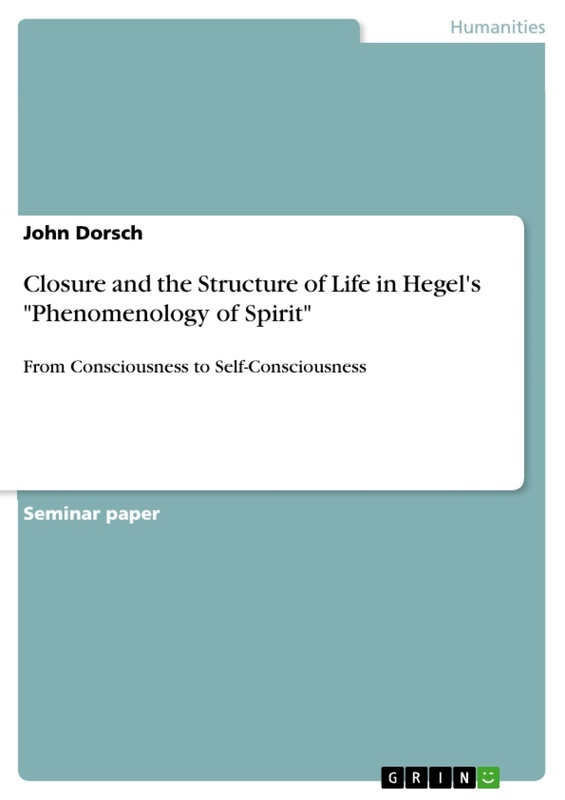 The transition from consciousness to self-consciousness in Hegel's Phenomenology of Spirit is as complex and controversial as it is as essential and influential. Understanding this transition requires the careful explication of Hegel's conception of life, independence, desire and recognition, as well as his conception of the infinite. In this paper, I interpret Selbststandigkeit, often translated as independence, as expressing the Axiom of Closure in Set Theory and I interpret the infinite through a linguistic conception of identity, with pragmatic and semantic constraints, and its notion in Mathematical Analysis, discussed by Hegel in his Greater Logic. With these rigorous notions and a direct reading of the principle text, I develop a transition from consciousness to self-consciousness that, I argue, affords a clearer perspective than currently offered by the literature. The conclusion is that recognition is not sought after through obtaining independence from natural or social determinations but instead through the understanding of oneself as a self-conscious living being. There are two main points that I would like to address in this paper. The first is that the concept of Selbststandigkeit, often translated as independence, and its relation to life, desire, and recognition has been neglected by contemporary research. There are some who only make cursory mention of its influence on the dialectic, such as Brandom and Honneth. Others, such as Pinkard and Neuhouser, claim that Selbststandigkeit is simply inherited as the criterion for truth from the earlier chapters on consciousness. This cannot be the case, however, because Selbststandigkeit does not play a role in the first two chapters on consciousness. Pippen seems to be the only one, to my knowledge, that gives an adequate account of the later emergence of Selbststandigkeit. But he fails to extrapolate its structure, claiming it to be simply the object of desire. This equivalence effectively limits Selbststandigkeit to being merely a product of self-consciousness, as desire first makes its appearance in that chapter. This cannot be the case, however, because Selbststandigkeit first appears in the last chapter on consciousness. Therefore, claiming it to be the object of desire is tantamount to neglecting some essential aspect of Selbststandigkeit. I think that a great deal of this neglect can be explained by the readiness to understand Selbststandigkeit as independence. The entailment of 'independence' is so open for interpretation that it can come to have anything as a referent. More problematic, though, is that it is impossible to show something to be independent, given an abstract enough conception of it. Selbststandigkeit, therefore, too often appears in an ad-hoc manner, suppling the contradiction needed to fuel the combustion of the dialectic engine. As a result, the explication of the transition from consciousness to self-consciousness suffers from a lack of conclusive argumentation. The plethora of interpretations and the consequent manifold of explanations offered by the literature makes just this case. I argue that we must, therefore, reject the interpretation of Selbststandigkeit as independence and hold any explanation of the transition from consciousness to self-consciousness based upon it as bereft. Instead, we must demand a rigorous interpretation that offers a clearly defined structure. The second point that I would like to address with this paper is relatively similar in nature. It concerns Hegel's conception of life. The details of 'life' are first developed in the chapter Force and Understanding and it appears once again in the chapter on self-consciousness. In the earlier chapter on consciousness, life is equated with the infinite. In the latter chapter on self-consciousness, life first plays a role in mediating desire and supplies, thereafter, the suspension (Aufhebung) of the conflict between desire and the agent. That life has this effect on the dialectic is often discussed in the literature. However, the structure of life, i.e. the impulse that moves the dialectic along its natural course, remains unexplained. Let us begin by analyzing the first mention of Selbststandigkeit in the Phenomenology. Once we have understood the initial case from the chapter Force and Understanding, we can monitor its entailment along the dialectic till it reaches the agent in the chapter on self-consciousness. 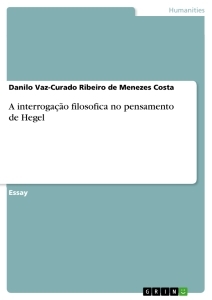 I will be discussing the Phenomenology directly and presenting it reformulated in English, expressing what ithink best fits the conception that Hegel intends. I will make use of the following translations: Einheit as set, Materien as elements, reflektiert as transposed, selbststandig as enclosed, Selbststandigkeit as closure, and aufheben as suspend. Force and Understanding begins by summarizing the first two chapters. Consciousness went from the senses, in Sense Certainty, to thoughts, in Perception. The agent was only able to arrive at thought through the medium of the unconditioned universal. In Perception, the unconditioned universal was, however, only seen from the one sided aspect of the agent. With this statement, Hegel is telling us that the unconditioned universal has not been thoroughly investigated. In Force and Understanding, the unconditioned universal is now the object for the agent and will, therefore, be the object of investigation. Because it is the object, the agent becomes aware, for the first time, of the difference between content and form. The structure of the combined content and form has the outward appearance of, on the one hand, a universal medium, which is likewise a set of many persisting elements and, on the other hand, as a set transposed onto itself. This transposed set destroys the closure of the varying elements. From these passages, we can conclude that by developing a theory of how a transposed set is able to disrupt the closure of its elements, we can confirm the interpretation of Selbststandigkeit as closure. In the next passages, Hegel inspects how the moments of a universal medium present themselves to the agent. He concludes that there are two. These two moments will be later expanded into, as I interpret them, Establishment of Closure and Disruption of Closure respectively. The first moment appears as the persistence of enclosed elements. The closure of these elements is constituted by the multiplicity of varying universals. The universal is itself a set with multiplicity. This means that the elements of understanding are contained therein but do not intersect one another as the differences of the elements are likewise enclosed. Hegel explains the second moment as establishing the set that exhibits the union of difference and sameness, which in turn causes the suspension of its elements, disrupting their respective closure. The suspension, Hegel claims, is the reduction of the difference to a pure for-itself. Inother words, the enclosed elements are contained in a set, and this set contains the differences of the elements as well. The two seen as one, as a reciprocal moment between the unified set and the individual sets of elements, is what Hegel calls force. To elucidate the above passage, I would like to introduce the example of the set of all animals. Within this set are the subsets of, for instance, mammals and reptiles. Seen separately, the properties that make an animal a mammal or, likewise, an animal a reptile, are enclosed within its corresponding subset. Contained within the set of animals are certain properties of both reptiles and mammals that are contained in both subsets, for example the need to consume other living organisms for the generation of energy. Being unified together in the set of animals is their suspension. The question remains as to how the set of all animals can be transposed, so that some elements of its subsets are no longer contained in those subsets. This would be the disruption of closure that Hegel writes about. One way of thinking about this is as follows: When looking at the set of all mammals alone, all properties of being a mammal are enclosed. However, when we view the set of all mammals from the standpoint of all animals, some elements of the set of all mammals, i.e those inherited by being a member of the set of all animals, find themselves outside of their respective subset, and instead in the sets of non-mammalian animals. Thus, a transposed set is a set that disperses the inherited elements among the subsets, causing the particular closure of each subset to be invalidated, because those elements are found outside of the subset, much as the set of animals disperses the element 'consumes organisms to generate energy' outside of each of its subsets. This notion corresponds to the notion of closure in Set Theory. However, this example doesn't actually disrupt closure, as the shared element is still contained in the subset, therefore more work must be done in order to develop the structure of closure in respect to Hegel's conception of it. cf. Brandom, Robert, Selbstbewusstsein und Selbst-Konstitution, in: Hegels Erbe, herausgegeben von Christoph Halbig, Michael Quante und Ludwig Siep, Suhrkamp Verlag, Frankfurt am Main, 2004 pp 46-78. and Honneth, Axel, From Desire to Recognition, in: Hegel's Phenomenology of Spirit A Critical Guide, edited by Dean Moyar and Michael Quante, Cambridge University Press, Cambridge 2008, pp 76-91.
 cf. Pinkard, Terry, Hegel's Phenomenology - The Sociality of Reason, Press Syndicate of the University of Cambridge, Cambridge, 1994. and Neuhouser, Frederick, Desire, Recognition, and the Relation between Bondsman and Lord, in: The Blackwell Guide to Hegel's Phenomenology of Spirit edited by Kenneth R. Westphal, Blackwell Publishing, Oxford 2009, pp 37-55.
 cf. Pippen, Robert, You Can't Get There from Here, in: The Cambridge Companion to Hegel, edited by Frederick C. Beiser, Cambridge University Press, Cambridge 1993, pp 52-86.
 cf. Hegel, G.W.F., Phanomenologie des Geistes, Felix Meiner Verlag, herausgegeben von Hans-Friedrich Wessels und Heinrich Clairmont, Hamburg, 2006, pg.93 (4-20).